Chlorpyrifos (marketed under the names Dursban and Lorsban, among others) is an insecticide used to control agricultural pests, mosquitos and flies. It's used as a soil treatment, seed treatment and spray. According to the EPA, about 10 million pounds are used every year, mostly on corn crops. Chlorpyrifos was at one time used residentially, and to treat pests that affect household pets, but residential use in the United States has been limited to child-resistant roach traps since the early 2000s. Chlorpyrifos binds easily with soil, where it can remain for months. It doesn't move about easily in the environment, but it has been detected in small amounts in both surface and ground waters in the United States. 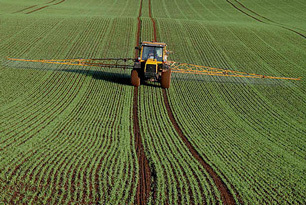 Chlorpyrifos can cause cholinesterase inhibition, an over-stimulation of the nervous system that, according to the EPA, can lead to symptoms of “nausea, dizziness, confusion, and at very high exposures (e.g., accidents or major spills), respiratory paralysis and death.” The agency has classified it as Group E, non-carcinogenic to humans.